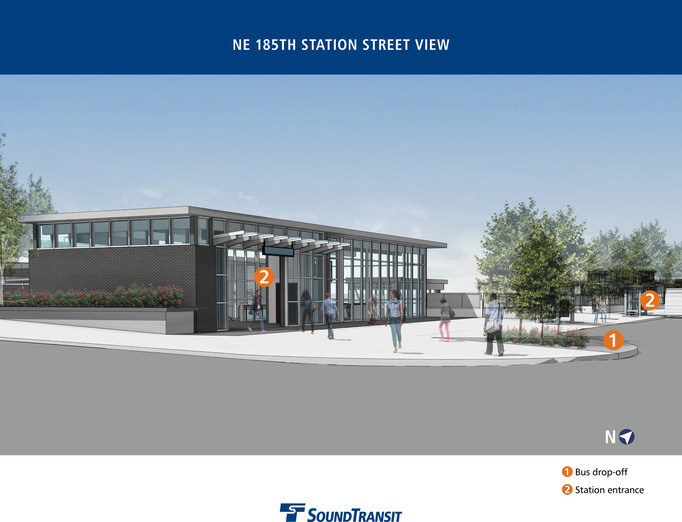 At the Sound Transit Board Meeting on Thursday, May 24, 2018, the Board approved the budget for the Lynnwood Link, with the assumption that they would receive the promised federal funding. 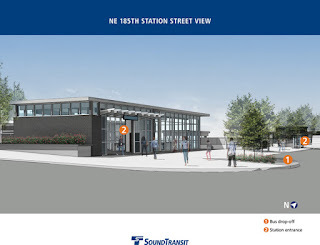 They formally approved the cost-savings plan to locate the 185th St Station (Shoreline North) from the west side of the freeway to Sound Transit-owned property on the east side of I-5 adjacent to the station, eliminating the requirement to improve pedestrian connections on or adjacent to the existing NE 185th Street bridge over I-5. Deputy Mayor Jesse Salomon testified that the City of Shoreline was in support of this change. The garage will have two levels of parking with a bus transfer loop on top level. Buses will enter and exit from 185th and cars will access the parking from 8th Ave on the east side of side of the station. They passed an authorization for the chief executive officer to acquire certain real property interests, including acquisition by condemnation to the extent authorized by law, and to reimburse eligible relocation and reestablishment expenses incurred by affected owners and tenants as necessary for the Lynnwood Link Extension. This includes 33 parcels of land - 18 full and 15 partial - in Seattle, Shoreline, Mountlake Terrace, and Lynnwood. There are 14 residential relocations. Those residents were notified by letter on May 18, 2018. Sound Transit normally puts property notices in the Everett Herald and the Seattle Times. They have awarded contracts for demolition of vacant buildings, which should start in June. Everyone whose property is being acquired, either fully or partially, has been notified. Nice of them... Sorry that home you've lived in for 40 years, where you raised your children and had many memories, it's gotta go so we can save a few bucks beefing up pedestrian walkways across 185th. But don't worry we've got brand new 800sq ft apartments you can live in with no parking for $3,000 a month. Gotta love it. Moving the parking garage to the east side of I-5 means that there will be no work done to the 185th overpass.